To be genuinely inspired by a work of Horror is a fairly rare occurrence for me. Rarer still is my being left awe-struck after discovering a book with which I resonated so deeply that I felt an instant kinship with its author. Such a delightful reaction has happened only a handful of times in my life: when I first discovered H.P. Lovecraft and Thomas Ligotti, when I read the first book-length collections by Simon Strantzas and Mark Samuels, and now with Dark Awakenings, the latest book by Matt Cardin. 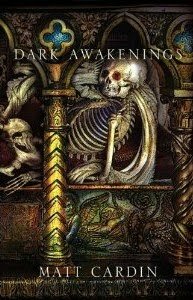 Though this collection is divided into two sections that distinguish Matt's superlative weird tales from his thought-provoking essays, it is difficult not to discuss Dark Awakenings as what Richard Wagner called a Gesamtkunstwerk ("total work of art"). Cardin swirls in everything from Eastern non-dualism to a postmodern milieu of dejection, from Christian mysticism to Ligottian vistas of malice and doom. His presentation comes as a united front that attracts and repels, inspires and frightens. As authors of supernatural Horror go, few today equal Matt Cardin. His grasp of characterizations is deft, his pacing sure-footed. But perhaps Matt's most enviable quality is his ability to seamlessly smudge deep philosophical principles into his narratives without coming off as didactic. "Teeth," "The Stars Shine Without Me" and in particular his novella The God of Foulness truly exhibit this talent. Cardin makes a reader ponder the nature of reality, yet at a turn he can summon images of startling terror, visions that unnerved this Horror author more than once. Equally compelling are his essays, which examine everything from the mystical underpinnings of George A. Romero's Dead films to the history of the Angel and the Demon. Dark Awakenings comes with my highest recommendation. Copies can be ordered here.